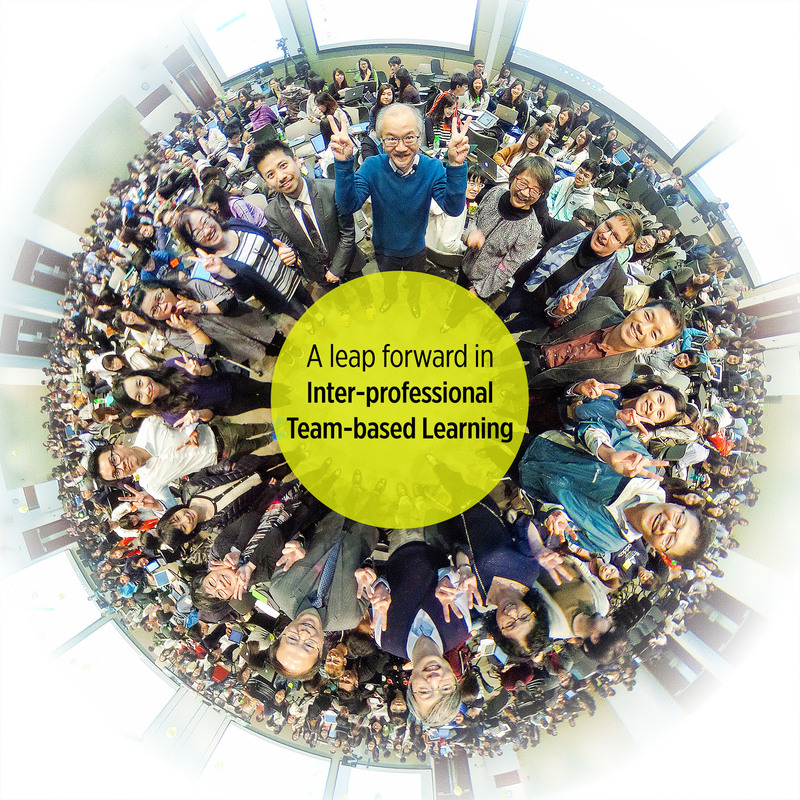 Inter-professional team-based learning (IPTBL) is an innovative teaching approach which aims at promoting peer-to-peer learning and collaborations across disciplines. In 2016, the Li Ka Shing Faculty of Medicine piloted IPTBL with nearly 600 medical, health and social care students from HKU and the Hong Kong Polytechnic University. This year, the organizing team scaled it up to serve more than 1,000 students from the following programmes: Chinese medicine, medicine, nursing, pharmacy, and social work from HKU; and medical laboratory science, nursing, occupational therapy, physiotherapy, radiography, and social work from PolyU. (1) Venue: To facilitate group discussion and communication between teachers and students, IPTBL was conducted this year in Lecture Hall II at the Centennial Campus, a flat area with mobile chairs and strong WiFi connectivity. Before: IPTBL was conducted in a lecture theatre setting in the 2016 pilot round. Students in groups tended to face the stage most of the time. After: Groups were arranged in circles this year. This picture features 71 small groups of five to seven students seated in the spacious Lecture Hall II. The IPTBL team would like to thank colleagues from the Examinations Office, Estates Office and Learning Environment Services of ITS who made all the six sessions possible. (2) Team progress chart: How to pace the 4-hour face-to-face IPTBL session is a big challenge. While the moderators and content experts had to be very conscious of the time, students also played an important role in moving the session forward. The newly added team progress chart displayed on one of the four screens in front of the hall, indicating whether a particular group had finished the assigned task – just like what a leaderboard does in online games. This provided motivation to students to complete their work in a timely manner, and also gave teachers some idea on which groups to interview in the interactive feedback session. (3) Peer evaluation: Team-based learning creates many opportunities for students to learn with, from and about each other through intensive interaction and collaboration. During each session, they got to know each other’s expertise and communication style. Peer evaluation is a mechanism for them to provide honest feedback to their peer teammates in terms of four competencies: values/ ethics, roles/ responsibilities, communication, and teamwork. At the end of each session of this year’s IPTBL, students would fill in their peer evaluation scores in an online form. They would then be directed to another page which showed them, in real-time, the average scores that he/she received from other teammates. Dr. LK Chan explained to students how to fill out the online peer evaluation form. By the way, did you notice the balloons in the picture? They indicate the group numbers so that teachers/ facilitators could quickly locate where the teams are. paying attention to teams or students who are not taking part (e.g., by inviting a range of teams to give their opinions). IPTBL is the Bronze Winner for Discipline Award (Life Sciences) in the prestigious QS Stars-Wharton Reimagine Education Awards 2016. The team celebrated the success after a briefing session in January 2017.
re-voicing students’ opinions when they contribute something that appears to be complex or not too well understood to students from other disciplines. Adding new functions to the online platform for running IPTBL to provide more informative feedback to both the facilitators and students. For those of you would like to learn more about IPTBL or contribute to it, please contact Dr. Fraide A. Ganotice, Jr., Program Coordinator at Li Ka Shing Faculty of Medicine, via ganotc75@hku.hk. If you want to get to know the technical aspects of running large classes, you may reach out to the Technology-Enriched Learning Initiative (TELI) via enquiry@teli.hku.hk. Look forward to IPTBL 2018! Hrynchak, P. & Batty, H. (2012) The educational theory basis of team-based learning. Medical Teacher 34, 796-801.